Paphos (Pafos) and sometimes even mistakenly said as Pathos, is the mythical birthplace of Aphrodite and today consists of four Municipalities. Those being Paphos, Yeroskipou, Peyia, and Polis Chrysochous (often abbreviated to Polis). It is also generally categorized as two regions, with the coastal area being known as Kato (low) Paphos, and the higher section being known as Pano (high) Paphos. One of the best attractions in Paphos is its fishing harbor, which is an ideal place for relaxation, and a great place to eat a platter of freshly caught and cooked fish. Also at the harbor is the Pafos Castle, built in the 13th century as a Byzantine fort. There are a wide array of excellent hotels in Paphos, and a vast choice of restaurants and tavernas serving local and International cuisine. You are sure to have fantastic holidays in Cyprus year after year, whether it be during high season for the hot summer sun, or for a late winter break to escape the cold British winter weather. 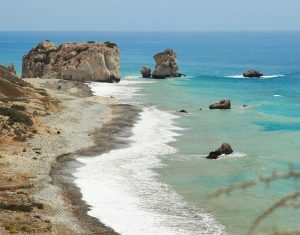 Paphos has some splendid beaches, mostly with white sand, although some are rocky beaches. You can sunbathe, swim or indulge in many water sports, or fishing trips, relaxing boat trips, or a party celebration boat trip, you can even take an undersea walk, however not all beaches will offer everything, so it is best to check first. There are also several excellent golf courses in this region. 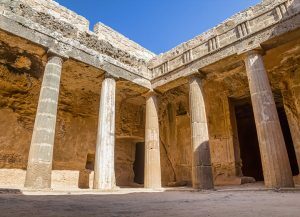 Paphos was chosen as European Capital of Culture 2017 and events related to this took place throughout last year. The Rock of Aphrodite is one of the first places most tourists head for which is, at Petra Tou Romiou (Rock of the Greek). Legend has it that this was the birthplace of Aphrodite, the Greek goddess of love and beauty, who arose from the sea. It is said that if you swim around the Aphrodite Rock, then you will be blessed with eternal beauty, however, as the seas here are quite rough, we wouldn’t recommend it. The Baths of Aphrodite are another favorite place for beautiful scenic views. The baths are found near Polis and said to be a source of fertility. The legend goes that after swimming in the crystal clear waters of the Bay, Aphrodite used to bathe in a serene pond nearby (the baths) surrounded by idyllic landscape, and sweet smelling wild flowers. It is here that she met her beloved Adonis for the first time. Mosaic at the ruins of the Temple of AphroditeThe Temple of Aphrodite – Near Kouklia Village one can visit the ruins of the legendary Temple of Aphrodite that once stood on a knoll about 2km inland of the old Kouklia, overlooking the sea. These ancient remains date back to the 12th century B.C. There is also a museum gothic Lusignan Court, where you can see the famous mosaic with Leda, and Zeus in the form of a swan. The Adonis baths and waterfalls said to be the place where Adonis and used to meet and bathe with Aphrodite, spending much of their time together here as it was their favorite place. It was also here that many of their children were supposedly born. However, it was also the place where Adonis died in the arms of his lover Aphrodite after a man disguised as a wild boar fatally wounded him in battle. The baths lie below a waterfall with high cliffs either side. Swimming in the Adonis baths is said to make women look younger and more beautiful, and men stronger. The Tombs of the Kings lies 2km north-west of Paphos harbor and is a large necropolis (a burial ground with structural tombs). Dating back to the 4th century BC, the underground tombs which are carved out of the solid rock, are not actually burial sites of any Kings, but are thought to be the burial sites of Paphitic aristocrats and high officials, and was named The Tombs of the Kings because of the grandeur of the tombs. The Mosaics of Paphos – There are five houses close to each other near Paphos harbor which have been named as The House of The House of Dionysos, The House of Theseus, The House of Aion, The House of Orpheus, and The House of Four Seasons. 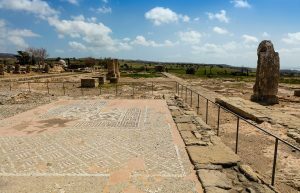 Each of these houses has remarkably preserved mosaic flooring dating back to the 2nd 3rd and 4th Centuries A.D. The mosaics depict scenes from Greek mythology, yet it is not known who the elite houses belonged to. The Paphos District Archeological Museum consists of five exhibition rooms which house archaeological artifacts and remains that were found during excavations in and around the Paphos area from Neolithic times to the 18th century. The collection continues to grow as more artifacts are unearthed from excavations. The Ancient Odeon, a small 2nd-century Odeon built entirely of limestone blocks can be found in Kato Paphos near to the remains of the ancient city walls. The Odeon is still put to good use today with musical and theatrical performances during the summer. The Folk Art Museum can be found at Geroskipou. Known as the House of Hadjismith because of the close relations its owner had with the British Admiral Sir Sidney Smith, and the fact that a member of this family had made a pilgrimage to the Holy Land (hadji means a pilgrim). The house, now listed as an ancient monument, belonged to Andreas Zimboulakis, who was a rich and educated man, appointed as British Consular Agent for western Cyprus and responsible for the provisioning of the British troops. It has been a Folk Art Museum since 1978 and it contains a large and diverse collection of exhibits originating from all over Cyprus representing the daily life, the various crafts, and activities and the different expressions of Cypriot folk art during the 19th and early 20th centuries. Get your free CTO map of Paphos.